Let me start out by saying that I am by NO means an expert at authentic Asian cooking. I do love Asian flavors and so does my family. One of their fave dinners is my Asian Chicken Meatballs. If we are in the mood for super authentic Asian food, we go out for it. I have had more than one epic failure in the kitchen while attempting to create some complicated Thai or Vietnamese dish. 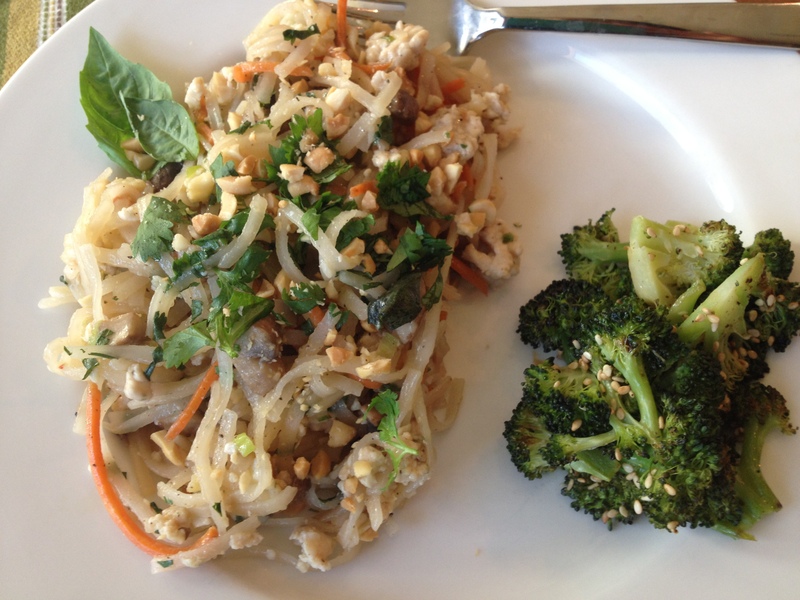 I’m just better off taking ingredients that we like and adding some great Asian flavors…and in this case I went with a Pad Thai-ish flavor profile. Although it was probably far from authentic, it was really good and my family loved it. I knew I wanted to use ground chicken for this dish and when I tried to find it at the market they only had non-organic ground chicken available. After seeing the documentary Food Inc. not too long ago, I really can’t fathom eating chicken that isn’t organic. 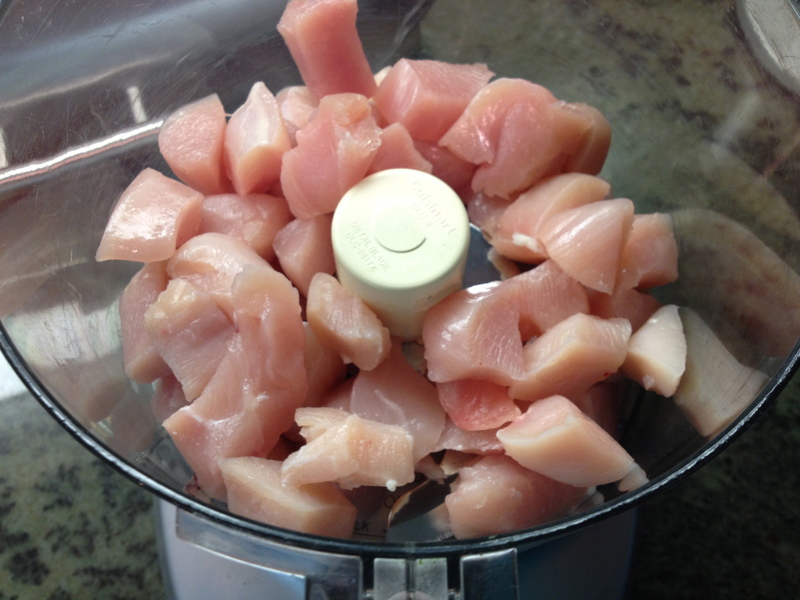 So…I bought organic free range boneless chicken breasts and ground them up in my food processor. It was actually very easy and came out great, but an extra step I would not bother to take if I could find organic ground chicken or if I had not seen the horror that is behind the mainstream chicken farms…yikes! 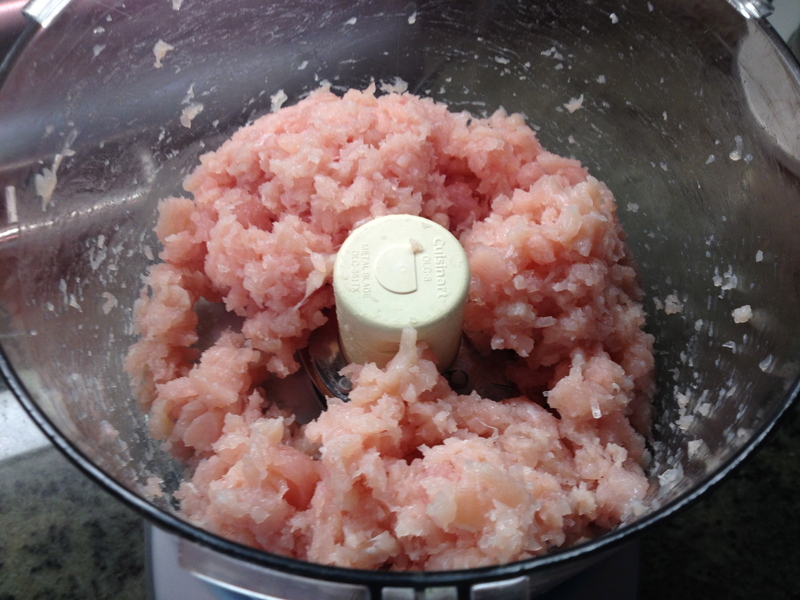 All I did was cut 2 organic, free range boneless chicken breasts (about a pound) into 1 inch cubes and pulse them in my food processor until it was coarsely ground. I used Pad Thai rice noodles, but you could easily substitute a fettuccine noodle or an wide egg noodle (just don’t invite your Thai friends over or you will be mocked). 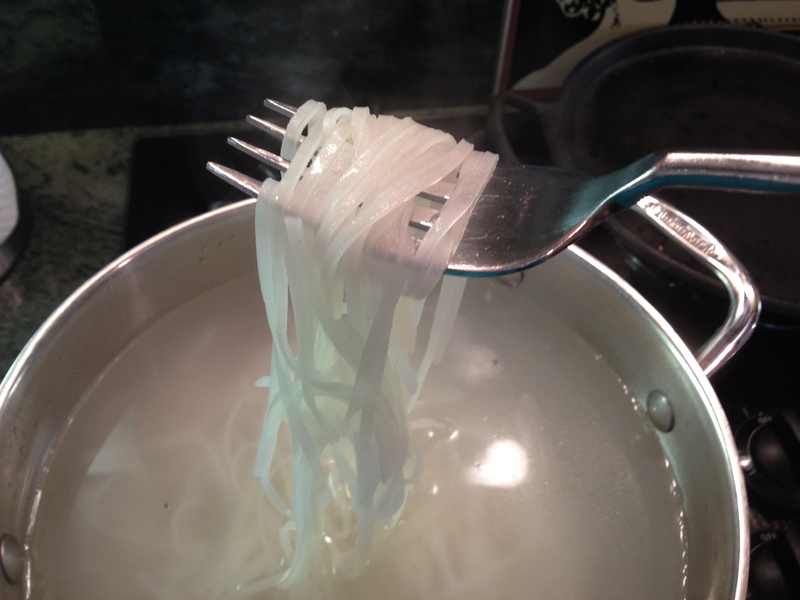 Rice noodles only need to be soaked in hot water for about 10 minutes before adding to the pan to fry. They can be tricky to work with because they get a little sticky and gummy when they sit. Your best bet is to have them soaking while you are frying up all your other ingredients and have them ready to drain and add to the pan right way so they don’t sit for too long. 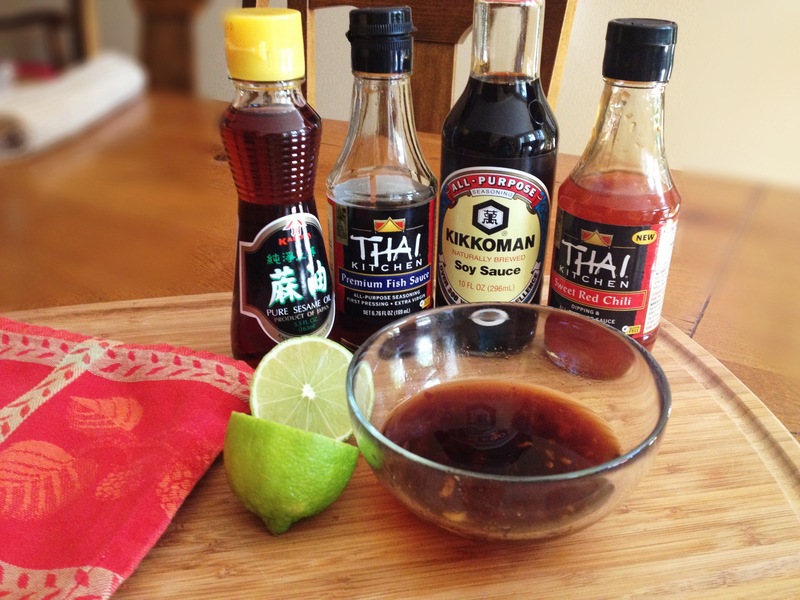 The sauce had a really delicious Thai flavor profile…so yummy! If you haven’t cooked with fish sauce, don’t let is scare you. 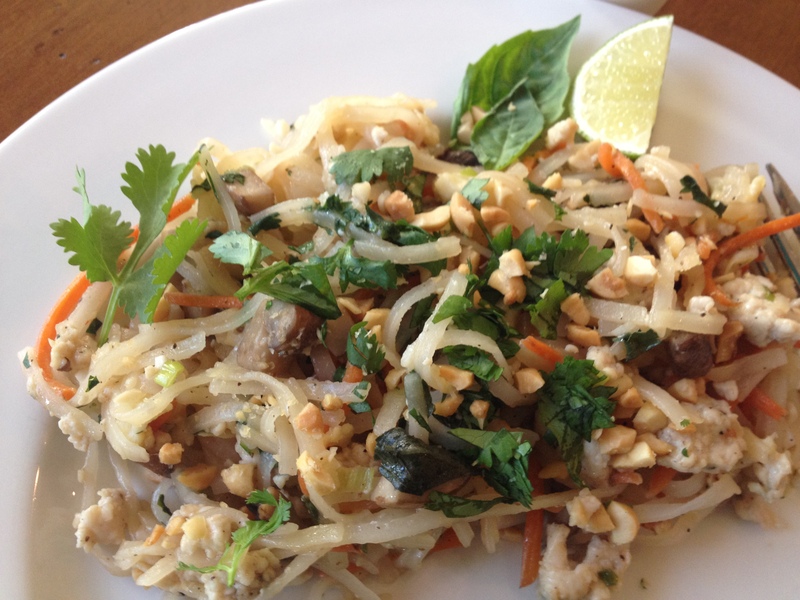 It adds such great flavor to Thai dishes. All of the ingredients that I used can be found in a regular grocery store. You could add this sauce to pretty much anything and it would be delicious! I would LOVE it if I had easy access to a well stocked Asian market, then I could have found Thai basil for this dish instead of regular basil. 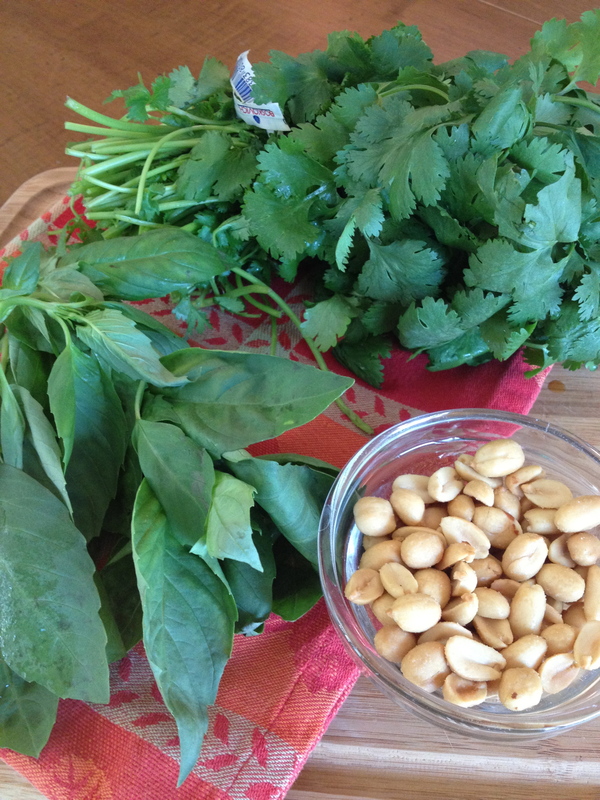 If you can find Thai basil…use it! I served this noodle dish with some yummy roasted broccoli that I added a little soy and sesame to so that I could give it an Asian flare. I also had some really good chilled Junmai Gingo sake that pretty much made my whole night. I LOVE sake and will use any excuse to drink it (including nights when I cook Trader Joes’ frozen pot stickers!). I just sliced some broccoli florets into halves (or thirds if they are big) and drizzled them with some roasted garlic olive oil. After roasting in the oven, I tossed them with a little soy sauce, sesame oil, and sesame seeds. There may be a few steps to this dish, but if you do all of your prep work ahead and have everything ready to cook, it comes together very quickly. *When I say pinch of salt, I really mean a pinch. You don’t need to use much salt because the sauce that you add gives it a lot of seasoning. You just need to add a little pinch when you are cooking each of the ingredients. Mix all of the ingredients for the sauce together in a small bowl and set aside. 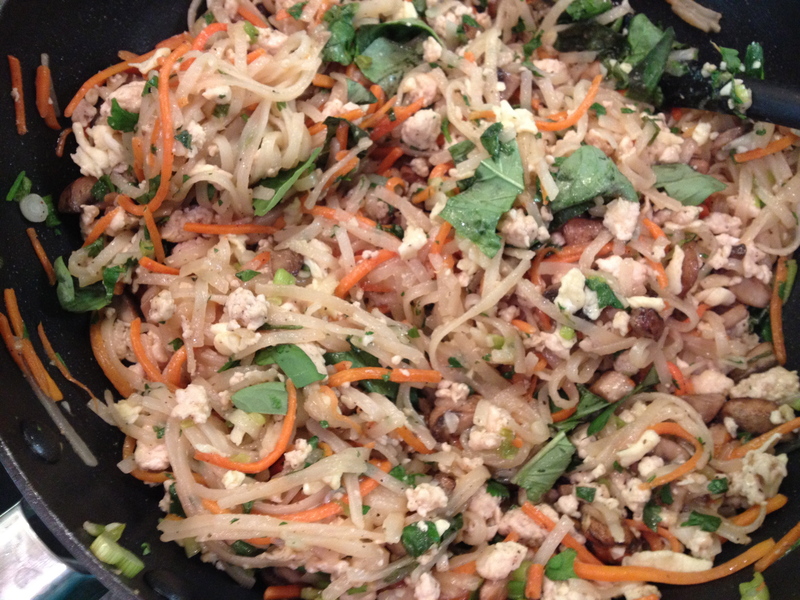 In a large pan or wok, heat a tablespoon of oil and add ground chicken. Add a pinch of salt and a few turns of pepper and cook, breaking up pieces until almost cooked through. Add garlic and continue to cook until chicken is done, then remove from pan and set aside. Add a another tablespoon of oil to the pan and add the mushrooms, carrots, green onions, a pinch of salt and some pepper. Cook for about 3-5 minutes or until the carrots just start to get tender then remove from the pan and add to the reserved chicken. Add just a touch more oil to the pan and add the beaten eggs. Scramble until cooked then remove from the pan and add to the reserved chicken and veggies. Add another tablespoon of vegetable oil to the pan and a tablespoon of sesame oil. Add the cooked noodles to the pan and fry for a minute tossing them in the oil. 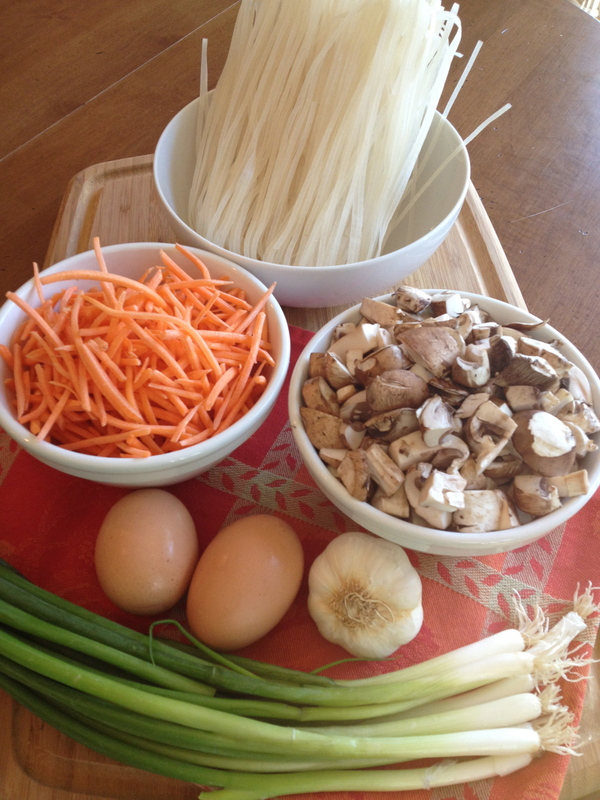 Add the sauce and reserved chicken/veggies/eggs to the pan with the noodles and mix well. Turn off the heat and add the basil and cilantro. Serve immediately topped with chopped peanuts and extra cilantro. Preheat oven to 425. On a large foil lined (easy clean up!) 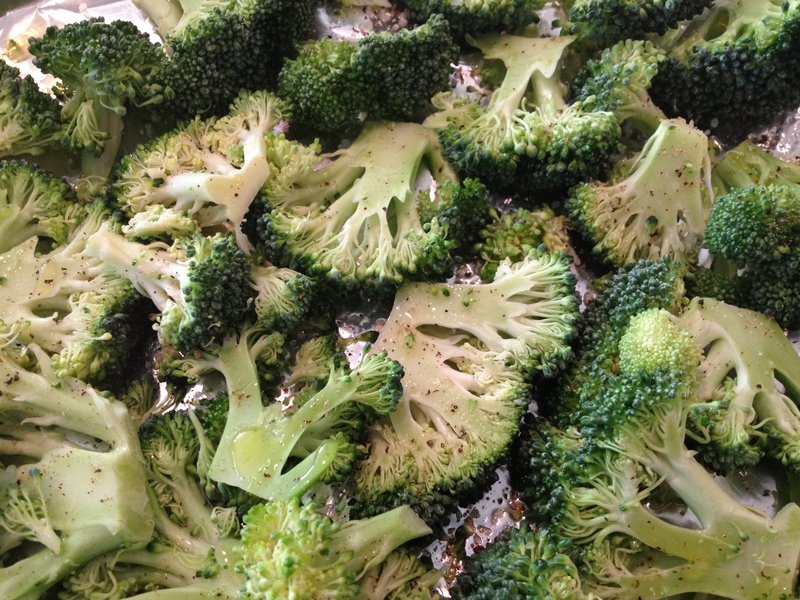 baking sheet, spread out the broccoli. Drizzle with the olive oil and sprinkle with some salt and pepper. Roast in the oven for about 15 minutes or until just tender. 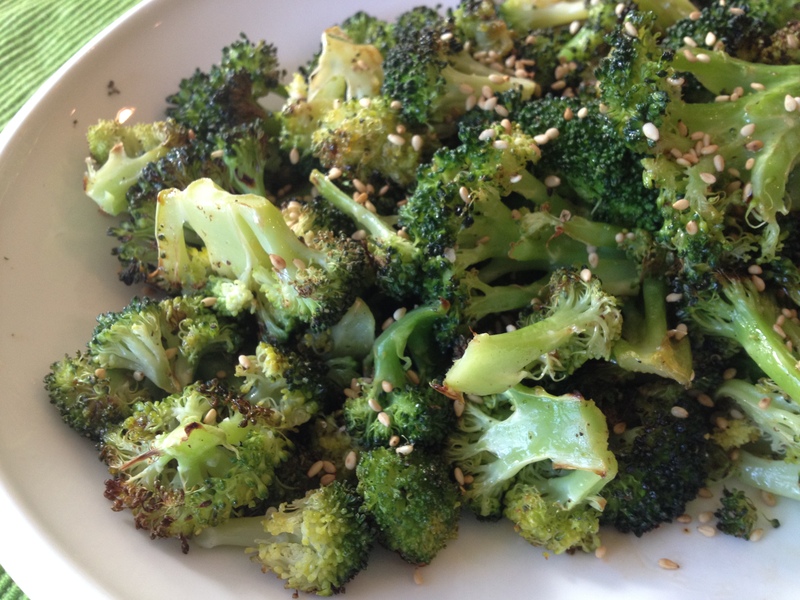 Mix the soy sauce and sesame oil together and toss with the cooked broccoli. Top with sesame seeds and serve immediately.